There is no real reason for this army to be there, except defense or offense against me. 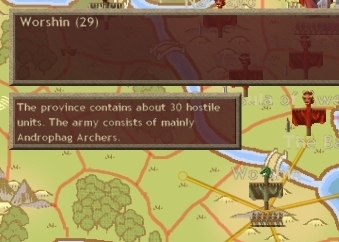 Yes, he could be going after Hinnom, or to capture some indep province to the west, but the main reason to have a mixed army in that province would be to invade me. 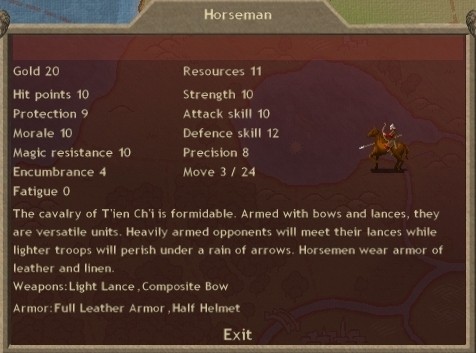 Horsemen are dangerous because they are cheap Light Lances, which have a hefty damage bonus on their first attack. They're also above average defense, but that isn't a concern for archers or my demons. 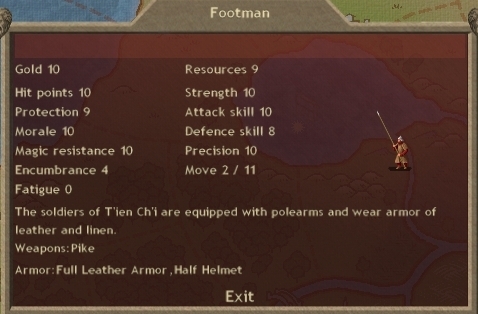 Footmen and Archers are leftover from his starting army, and pretty poor. 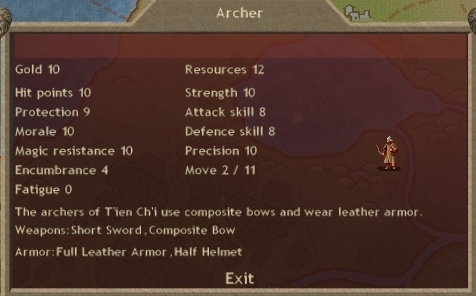 The archers have a good bow, certainly more dangerous than my Atavi, but 12 resources makes them hard to mass. 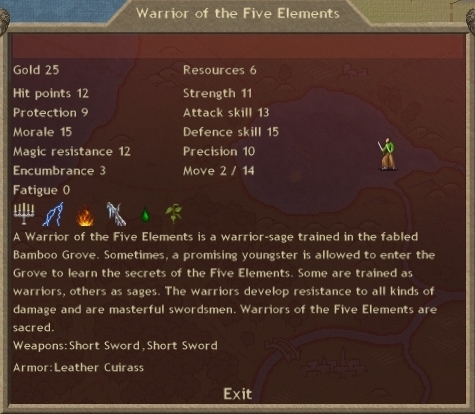 Warriors of the Five Elements are offensively dangerous sacreds. 13 attack and double short swords gives them a lot of offensive power. 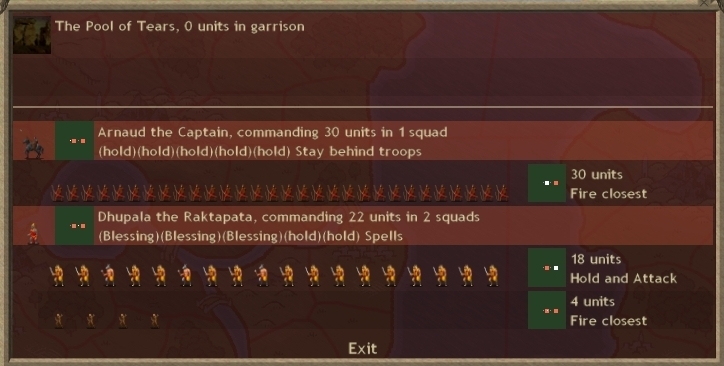 15 straight defense (no shield) is absolutely absurd for a recruitable unit. They also have 50% resistance to all 4 of the elements. Troop resistance spells add only 50%, so WotFE are the only troop in the game that can be made immune to all of the elements after being buffed. This is a lategame thing however. On the downside, 12 hitpoints is tiny for a sacred, and since offensive spells are high damage, the lack of hitpoints makes their 50% elemental resistance irrelevant, in the early game. How to handle WotFE depends a lot on their bless. A W9 bless would make these difficult for my demons to hit, but wouldn't do anything about their archer vulnerability. A10 (80% air shield & 75% Lightning Resistance) would make them invincible to my archers and lightning evocations, but my demons would have an easier time. S9 improves their resistance to my archers but doesn't help them much in melee. Finally, F9 would tear apart my sacreds in melee, but get mowed down by my archers. This is the first exercise in offensive / defensive movement. Mastering army movement is HUGE in dom3. It is perhaps the single most important skill. But no one really mentions it, and it hasn't been covered in previous LPs. In this case, I'm deliberately moving counter to how he could move against me. This puts us in a near-50-50 situation on who gets to move. 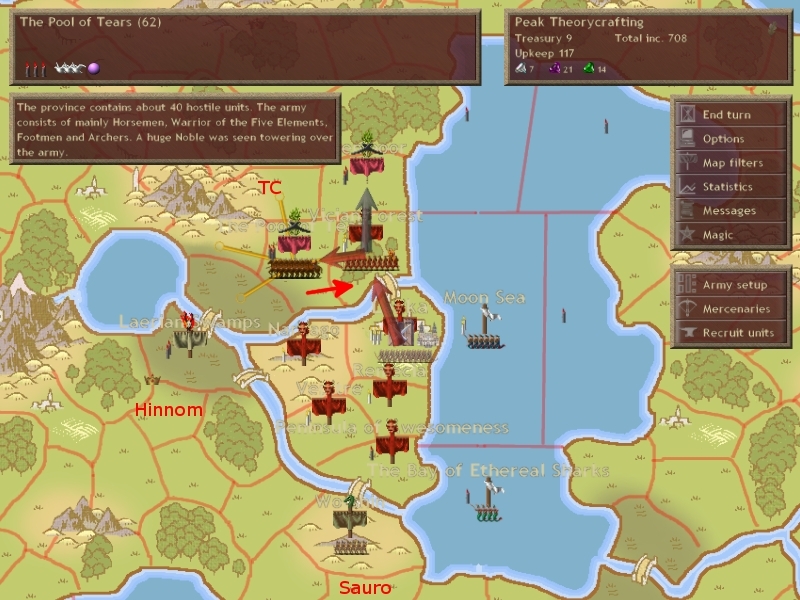 If he moves, in the resulting battle I get first strike and have use of my reinforcements and province defense. If I move, I get the opportunity of putting him on the defensive. The faster this war is over, the better for me, since I'm the one who is boxed in. Attacking the undefended province would be the wrong choice. If he attacks, my reinforcements will have to handle his army on their own, and chances are they'd lose. This would cut off my main army. Bad situation. It's a bit of a gamble to attack into him instead of not moving. Yes, not moving would guarantee me defensive advantage if he attacks. But he might not attack: I might be mistaken that his purpose was to attack me, or he might also want defensive advantage. I'm up here to wage war against TC, the sooner I gain provinces the better, so being aggressive is hopefully the right choice. Archers should be in range, closest will hopefully fire on either his cavalry or his sacreds (both unshielded), and hold-attack orders will let me get off more volleys. If I'm engaging with PD support, I'm centrally placed, so any PD that appears in the center of my battlefield can be integrated into my formation. As you can see, I'm also bringing my starting army, once again filling its role as arrow catchers. Recruitment is all sacreds, to cover likely losses this turn. You increase your tempo by recruiting reactively to likely events rather than reactively to what's already happened. That's a Hinnom scout we caught patrolling. Its pretty normal to catch scouts and not considered an offensive action to scout others. Tax is back down to 100% this turn with no unrest. Down south Sauro has conquered the last indep province with a force of pure Androphag Archers. Since it was indep last turn, hopefully nothing to worry about. Next turn: "i'd much rather not do that again"